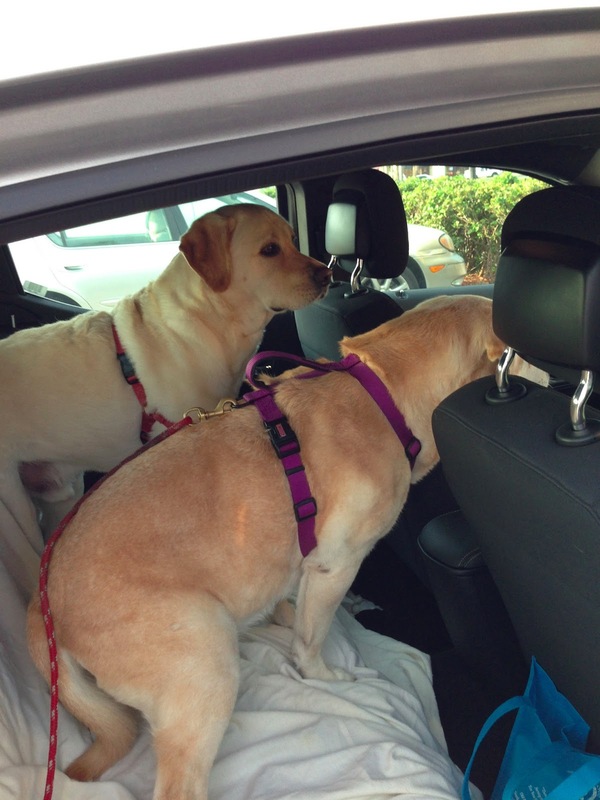 TakingPaws: What'd ya Mean No Dogs in a Rental Car? What'd ya Mean No Dogs in a Rental Car? Jeff had to drive down for the Miami Boat Show last week so we decided to rent a car for a week. That way we could easily re-provision, see some of the sites, etc. We needed to have some of Dyna's blood work redone to find out if there were any improvements in her liver levels. So early Thursday morning we loaded the kids in the rental car and headed to the vet. 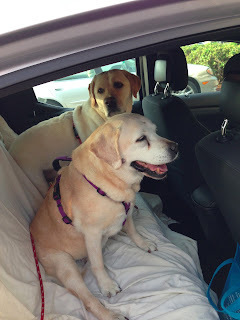 We've done this rental car thing many times from the boat and have used a variety of methods to try and keep the bulk of the dog hair at bay. My latest creation involves a flannel sheet with Velcro attached and holes put in to accommodate the harnesses we use to strap them in. It works pretty well. Of course, this car had an all black interior - not good for this crew. We brought Dylan along because he loves rides and we wanted to get him weighed. Lately he's been, well, a little larger in the rear end. It hasn't helped that Dyna has become more finicky about her eating. It's a constant battle to keep Dylan from scarfing up the dropped and left-over food. Unfortunately, Dyna's blood work has not improved so we need to explore what might be happening with her liver. We decided the best place to settle in and do that is Jacksonville. So tomorrow we leave to begin heading that way. On the good side her digestive issues are better so she hasn't lost any more weight. As for Dylan, well, can you say portion control? We'll keep you posted on Dyna's progress. Poor Dylan - so hard to be on a diet when other family members get to eat whatever they want. Hello, I am a topic coordinator for The Monkey's Fist, and we're collecting links about dogs on board. Is it okay for us to link to Dyna and Dylan's blog? We'd also like to link to your dog articles on Active Captain. Very funny, we have had the same thing happen to us with rental cars (we have a four year old black lab on board with us). We have even stopped and vacuumed out the entire car before returning it. Ends up cleaner than when we picked it up. Hope Dyna improves. Dyna and Dylan are very flattered that you like their blog and wish to include it. Dylan would be even more flattered if you sent him treats... Please do (include the blog, not send treats). You would have been great in this rental car! Dylan would love to play with you sometime. You might try watching Dyna's alcohol intake. Maybe cut out the scotch. Seriously though, I hope the vet can find out what's going on. We just lost Gertie the cat because two different vets, running all kinds of tests, couldn't determine what was happening. She just wasted away. Our best thoughts are going out to Dyna. Maggie sends her best. She also has some weight issues but they parallel Dylan's. perhaps Lee and Lynn shouldn't have gotten in the habit of rewarding her for taking pill with Nutter Butters! Wags to Dyna.